As the value of social good initiatives has increased, so has the complexity governing relationships between businesses and nonprofits, the terms used to describe them, and the points of entry. One size does not fit all. Lumping together all relationships under a term like “cause marketing” shortchanges the potential to optimize return for all parties. Below, our guide to the key concepts and types of relationships. Branded Citizenship. Describes the growing corporate practice of promoting altruistic efforts under an umbrella brand. While specific initiatives and partnerships under the umbrella may change, the brand remains. Ideally, this provides a bigger footprint to the company. For example, “Live Positively” is the Coca-Cola Co.’s umbrella for its good works. By presenting “Live Positively” alongside its recycling programs, its partnership with World Wildlife Fund and its support of youth sports, Coca-Cola hopes to increase recall. Umbrella brands can serve an important role, not just in marketing, but also in internal communications. For example, Procter & Gamble’s “Live, Learn and Thrive”—a corporate initiative through which P&G channels products and resources into more than 100 programs across 60 countries to improve life for children around the world—is a source of employee pride and contributes to recruiting and retention. Efforts run the gamut from life-saving vaccinations and safe water in Africa to safe homes across Europe; and educational opportunities in Asia to early childhood development in Latin America. The initiative, centered on enhancing child well-being, is woven into P&G’s philanthropic giving, cause marketing, product donations, disaster relief and employee engagement/HR programs. Another example, the NBA’s “Read to Achieve” program, is a year-round campaign to help young people develop a lifelong love of reading and encourage adults to regularly read to children. In addition to being supported by all 29 NBA teams, 16 WNBA teams, and the teams in the NBA’s minor league, the National Basketball Development League (NBDL), “Read to Achieve” is supported by the NBA’s officials, parents and wives of players, the NBA Players Association and Retired Players Association. NBA teams implement their own “Read to Achieve” programs in local markets. Some are sold to sponsors. Others build on community synergies. For example, the Boston Celtics Shamrock Foundation promotes “Read to Achieve” in partnership with publisher Houghton Mifflin Harcourt, and builds on the Mayor’s literacy initiative “ReadBoston”—all with the goal of ensuring the city’s elementary school students read at grade level by middle school. Clearing that benchmark earns the students Celtics prizes, such as Celtics-branded notebooks or game tickets. Schools with the highest level of participation host assemblies with Celtics players and other VIPs. The school that wins the yearlong writing assignment challenge receives a library upgrade. Buy-One-Give-One (BOGO). A model popularized by TOMS, which donates a pair of shoes to a needy child with each purchase of a pair of its shoes, BOGO is being used to market small items like toothbrushes (Smile Squared) to more expensive items like eyeglasses (Warby Parker). Similar to cause marketing (see below), the “gift” or donation is triggered by a transaction. But while cause marketing typically runs for a designated time period, e.g., six weeks, TOMS, Warby Parker and other users of BOGO run their offers year-round. It is noteworthy that TOMS has tweaked its model and now, rather than giving away shoes with purchase, it is using purchase to trigger an action that better addresses the underlying causes of poverty, or other problems such as infant mortality. For example, TOMS built shoe factories in Haiti and Kenya. And with the purchase of TOMS eyewear, a donation is made into a fund that conducts eye exams and surgeries. A TOMS purse secures training for midwives. Cause-Related Marketing. An arrangement between a business and a nonprofit whereby behavior—such as purchasing a product or service, applying for a loan, taking a test drive or posting something in social media—triggers a donation. The concept of cause marketing was created by Jerry C. Welsh who, while Senior VP of worldwide marketing at American Express, had the idea of linking card usage to donations. The company’s first national cause marketing campaign debuted in 1983 in support of the Statue of Liberty’s renovation. AmEx donated a penny to Ellis Island Foundation for each use of the American Express card and a dollar for each new card. A four-month period saw $2 million raised for Lady Liberty and a 28 percent jump in transaction activity. And the concept that doing good was good for business was born. In some cases, a business will make such a large and long-term commitment to a cause marketing initiative that it becomes a stand-alone brand. An example is General Mills’ “Box Tops for Education.” Over a 20 year period, the program has generated $700 million for the nation’s schools. It has also become an asset with so much equity that General Mills attracts cosponsors. 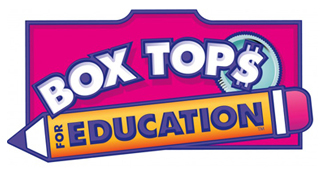 For instance, Ford cosponsored “Box Tops for Education” with its own offer to give away 250,000 box tops. Co-Branding. Pairing two or more brands to create a separate and unique product. Because nonprofit brands typically have higher levels of trust, such alliances can build the commercial partner’s brand equity and establish other desirable associations. For example, Target and FEED created a co-branded line for “aspirationals” that benefited Feeding America. Understanding that Millennials want fun, simple ways to make real, measurable impact—and they want to do it with style, favoring the 1:1 giving model popularized by TOMS, which has given more than 11 million pairs of shoes to needy children—FEED highlighted the number of meals funded per purchase (e.g., buy this $25 storage bin and Target will provide 20 meals to needy families). The 50 co-branded products included home, sporting goods, stationery, apparel and accessories ranging from $3 to $400. Corporate Giving. Grants that are typically managed by a company’s community affairs or public relations department. Corporate giving programs are not separately incorporated, and so are not subject to the laws that a private foundation would be. Companies may deduct up to 10 percent of pre-tax income for direct charitable contributions (this includes giving to the company’s foundation). The average rate is closer to one percent. Corporate giving programs can involve cash, employee matching gifts and in-kind gifts of a company’s products, services or volunteers. Corporate Philanthropy. Support for a nonprofit with no expectation of commercial or economic benefit. However, research findings reveal that corporate philanthropy does result in improved corporate image and attitudes toward the firm. Fees are restricted and tied to cost of the program being funded (as opposed to the value delivered to the donor). Companies are increasingly bringing more focus to their donations, tying philanthropic activities to business goals and objectives. Synonym: Patronage. Corporate Social Responsibility (CSR). CSR is the idea that in addition to profit, businesses should be concerned with some wider social good or benefit. Rooted in the belief that businesses are accountable for their actions, not just in a formal sense to their owners, but also in less well-defined ways to a group of wider stakeholders, CSR recognizes the context of the legal and regulatory environment. Sometimes referred to as Corporate Citizenship and Corporate Accountability, CSR was introduced to English readers by Howard Bowen in his 1953 book Social Responsibilities of the Businessman. Despite efforts to formalize and regulate CSR-related evaluations, measurements and reporting (e.g., ISO 14000, AA 1000, GRI), the concept and its application are largely dynamic, diverse and context specific. Definitions of CSR vary by country, author and decade. CSR has been criticized as a modern-age branding tool, a ”greenwash” of corporate behavior. At publicly-traded corporations, CSR is often viewed as a risk management tactic. However, the ProSocial Valuation Service team instead views CSR—which we call Corporate Social Opportunity—as investments that measurably enhance lives and communities, enabling organizations to recruit and retain the best talent, attract the most loyal customers, and appeal to the most desirable suppliers. Employee Volunteering. Formalized support of the volunteer efforts of employees, retail partners and/or franchise members. Rationale: Global organizations today must navigate a new world of work. As demand for talent escalates, the balance of power in business is shifting to the employee. In this world, organizations need to create incentives beyond pay and vacation time to stay relevant. Opportunities like volunteering matter, because they enable employees to find deep and personal meaning in and outside of work. In addition to the social capital created, corporate volunteering programs contribute to employee recruitment, satisfaction, retention and productivity. Example: In celebration of Earth Day, during April and May some 1,800 Timberland employees donated 13,000 hours of services to 60 projects in 20 countries. And Timberland’s “Path of Service,” introduced in 1992, provides full-time employees up to 40 paid hours annually to serve in their communities. Timberland organizes two annual global service events for employees and partners—Earth Day in the spring, which focuses on environmental projects; and “Serv-a-palooza” in the fall, centered on addressing community-based needs. Fundraising Partnership. The use of a company’s resources—channels, media, events, employees, etc.—to raise money for a nonprofit. For example, many supermarkets have canisters or scannable coupons for charities at the check-out lanes. The amount raised typically dwarfs both the rights fee sponsorship model and the philanthropy model. For example, since 1987, Walmart and Sam’s Club have raised more than $900 million for Children’s Miracle Network Hospitals. Other types of fundraising partnerships include special merchandise. 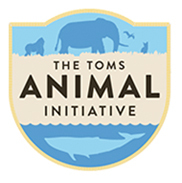 Another example: TOMS and Wildlife Conservation Society joined forces to launch a limited-edition footwear collection, inspiring people to take a stand for elephants and support efforts to protect them globally. As always, with every pair of shoes purchased, TOMS gave a new pair of shoes to a child in need. Mission Marketers. Companies designed with a purpose greater than the product or service being sold. This is typically a reflection of a founder of a privately-held company who can take a stand likely deemed too risky by publicly traded companies. While the stand may be off-putting to some, it typically solidifies loyalty among others. Unlike social entrepreneurs, however, mission marketers did not start their companies to serve society, but have made purpose a part of their brand’s DNA. Anita Roddick’s Body Shop was one of the first companies to be as much about advocacy and education as it was about transactions. Today’s mission marketers are activists. 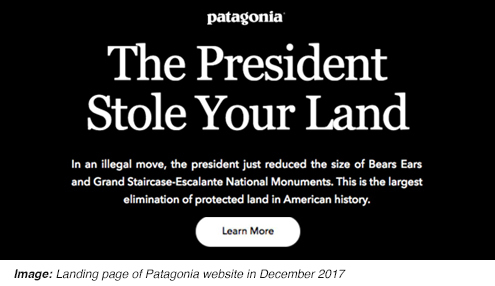 Patagonia, for example, is suing the federal government over its plan to diminish the size of Bears Ears National Monument in Utah. Promotional Partnership. An alliance in which a company or media outlet promotes a nonprofit and its message. While no cash changes hands, the company’s promotions build the cause’s brand and affords its message wider circulation, which should lead to new volunteers and donors, behavior changes and other benefits. The Environmental Defense Fund has a group of promotional partners that discusses the threat of global warming on packaging and collects signatures in support of legislation. Example: Food Network was a promotional partner of “Share Our Strength.” It produced PSAs and devoted ad time and space to SOS messaging on Food Network, FoodNetwork.com and in its monthly magazine. Social Marketing. Campaigns designed to improve the welfare of society and its citizens by influencing beliefs and behavior, such as increasing physical activity, consuming less sugar and signing up to be an organ donor. Johnson & Johnson, for example, worked with Safe Kids Worldwide to encourage parents to teach safety practices to their children, such as using helmets when cycling. Sponsorship. A fee paid to a property—cash or in-kind—in return for access to the exploitable commercial potential associated with that property. Unlike philanthropy, sponsorship is done with the expectation of a commercial return. Sponsorship fees are unrestricted. Sponsorship value is tied not to cost, but rather to the exploitability of the rights and benefits including the intellectual property. Sponsorships often include several components and can be funded from multiple areas within a company, such as brand marketing, HR, CSR and philanthropy. 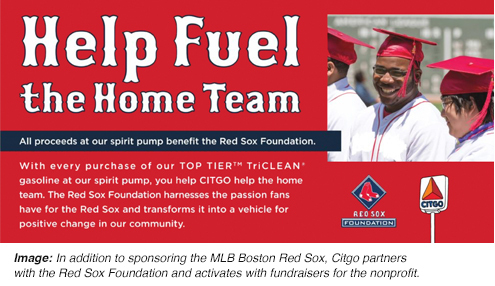 See Citgo/Red Sox example below. Strategic Philanthropy. Refers to the deployment of marketing dollars to promote philanthropic initiatives. Example: Bell Canada’s “Let’s Talk” mental health initiative began with a five-year, $10M per year commitment from the company. It raised additional funds for Canadian mental health programs linking donations to texts, tweets and Facebook shares about mental health on designated days.